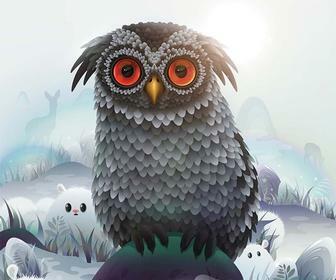 Artwork: Thomas Burden – learn how he created this artwork in his Illustrator tutorial. Arriving a mere seven months after its predecessor, the 2017 MacBook Pro largely catches up with the competition performance-wise – but the aesthetically-beautiful design hampers its practical usefulness. As someone who appreciates design, the looks of the MacBook Pro have been made to woo you. This is the laptop you want on your OpenDesk next to your Dalù lamp, on the train to garner envious glances from fellow travellers, in that meeting with the client you really want to work with that super amazing project. And even though the competition has raised its game massively over the past few years, the MBP is still the best-looking model on the market. The design is also the MacBook Pro's biggest failing. Seven months after Apple debuted this chassis on the 2016 MacBook Pro, its singular approach to ports have proved frustrating for a great many users – and Apple's response to the likes of Dell and HP offering touchscreens on their laptops, the Touch Bar, is still poorly supported. Instead, this new MacBook Pro's new features are all hidden away. There's a choice of new chips – Intel's 7th-generation 'Kaby Lake' Core processors – faster RAM, and more powerful graphic chips. Everything else is the same – thankfully including the price. Back in November 2016, the new MacBook Pro arrived disappointingly late. 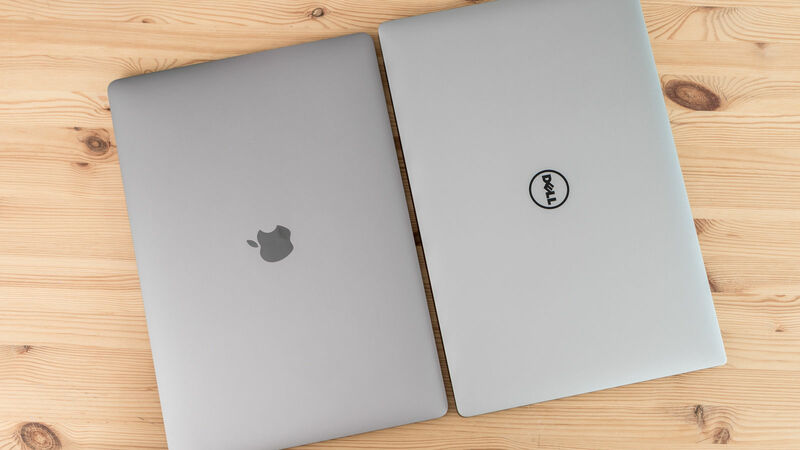 Dell and HP had upgraded their pro laptops – the Precision 5510 and ZBook Studio G3 – to Intel’s then new 6th-generation Core i7 processors at the beginning of the year. Apple’s arrived nearly nine months later, having not been updated since mid 2015. Right now, the 2017 MacBook Pro arrives about a month after the also-7th-gen Dell Precision 5520 and around the same time as HP's ZBook Studio G4. So you can now buy the MacBook Pro without feeling it'll be out of date within a year. We've yet to receive review units of the 5520 or new ZBook Studio, so for now we'll be comparing the MBP against older models from Apple, Dell and HP. We'll be updating this review when we've looked at Dell and HP's rivals. 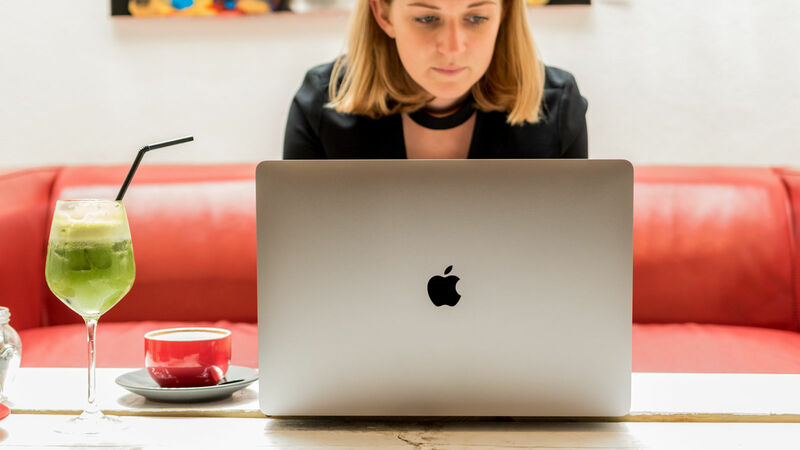 Our review MacBook Pro is the top-of-the-line standard configuration – ie you can customise it with faster components with Apple's build-to-order system. It has a 2.9GHz Core i7-6820HQ processor, which could be upgraded to a 3.1GHz chip. There's 16GB of RAM – which, unlike with the 2016 model, can be doubled to 32GB. There's an AMD Radeon Pro 560 graphics chip with 4GB of its own RAM, and 512GB of fast SSD storage. This will set you back £2,249 plus VAT – that's £2,699 inc VAT. 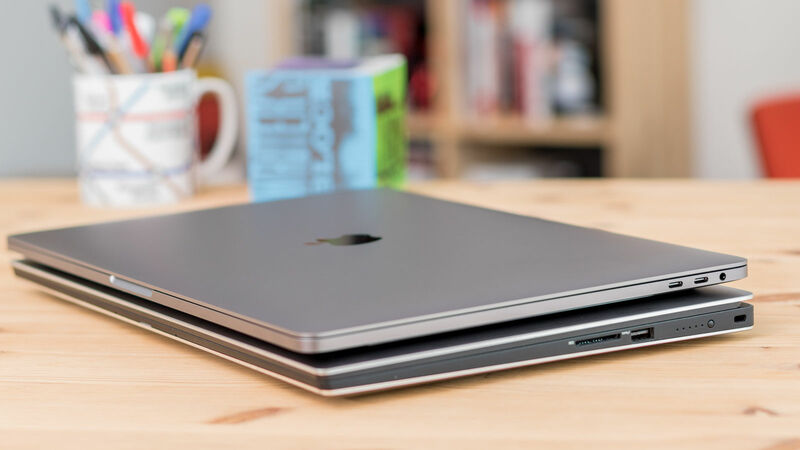 For comparison, we're pitching the 2017 MBP against both the 2016 model and the 2015 one – as if you currently own an older model the performance jump is quite marked. We've also measuring its performance against the previous fastest laptops around – Dell's 5510 and HP's ZBook Studio G3. In the Cinebench rendering test – which is based on the processor alone – the new MacBook Pro was seven percent faster than its predecessor and five percent above the fastest 6th-gen model (the 5510). We also saw a marked improvement in Cinebench’s realtime 3D test – but it was still bested by the NVidia Quadro-powered HP ZBook Studio G3 – proving that PCs still have the edge for high-end 3D work. You can see the results below. Results are in Cinebench's proprietary units and longer bars are better. We also tested all laptops using Adobe After Effects – which is the best all-round test of a laptops’s overall performance. This is a tricky test to compare laptops using, as Adobe updates After Effects around every six months to as year – so we can only look at results for how the version of AE contemporary to the release of the laptops runs. Again the results follow the same pattern for our standard test – where HD video, animation and effects are layered in 3D space to really push the system. 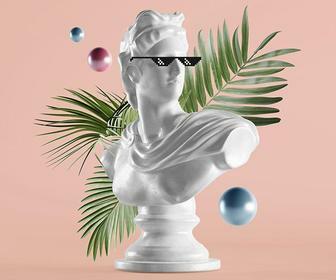 But throw in 3D objects using AE's Cinema 4D-based CineWave system, and the Mac is less impressive – though this could be as much down to Adobe and Maxon's tech as Apple's. The 2017 MacBook Pro’s 15.4-inch screen is identical to the previous model's. It's gorgeous to look at with deep and rich colours – but the same is true for Dell’s Precision 5510, HP’s ZBook Studio G3 and the Wacom MobileStudio Pro we’ve just had through the door. These all have higher resolution screens than the MacBook Pro – ‘4K’ 3,840 x 2,160 displays that have 60 percent more pixels than the MBP’s 2,880 x 2,160 resolution. Apple has made much about this MacBook Pro being able to output the full DCI P3 colour space used for films for digital cinema output. However, it’s the Adobe RGB colour space that really matters as this is what’s used internally by tools from Photoshop to Illustrator to Premiere Pro – and again here the MBP is lacking. In our tests with a DataColor Spyder5Elite colorimeter, we found that the MacBook Pro’s screen can output 91 percent of the colours in the Adobe RGB. The screens on both the Dell and Wacom models can output the full 100 percent of Adobe RGB. The MacBook Pro’s display was the most accurate in our tests – though only ahead of its rivals by a very small amount. 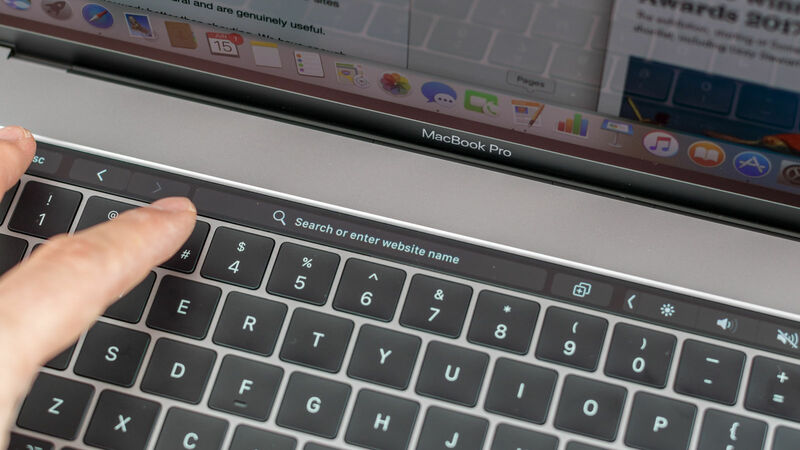 For some users – including anyone like me who often has to work while travelling in cramped conditions (whether train or plane) – another point against the MacBook Pro’s screen is the lack of a touchscreen option – though instead it offers the much-discussed Touch Bar. Running along the top of the keyboard where the function keys used to be is a strip-like OLED touchscreen called the Touch Bar. In it's simplest form, it replaces those buttons with ones that change their appearance to match what they do - showing a save or brush icon so you don't have to remember that the function key for what you want to do is F4 rather than F5. It can do more though, as software developers can put any type of control surface they like - that'll work as part of a long thin strip - from volume sliders to a timeline in Final Cut Pro to colour palettes and brush sizes in Photoshop. It can also do less, showing function keys if you like. In Photoshop, the Touch Bar is quite useful – much easier than trying to adjust brush size using on-screen controls with the trackpad. But support for the Touch Bar is limited to layer properties, brush parameters and favourites. Read: Here’s how Photoshop works with the new MacBook Pro Touch Bar. However, seven months after the launch of the first MBP with a Touch Bar, the only other Adobe app with support for it is Premiere Pro. 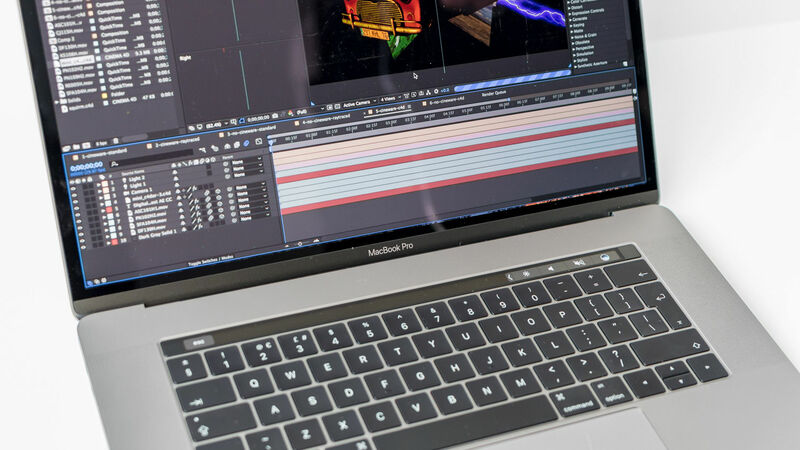 This works well for scrubbing through your Timeline, but Premiere Pro benefits even more from a full touchscreen laptop where you can use your finger to scrub the timeline and within clips in the Library. And quickly flick clips to insert, overlay, replace or overwrite. And quickly open and hide panels. And more. 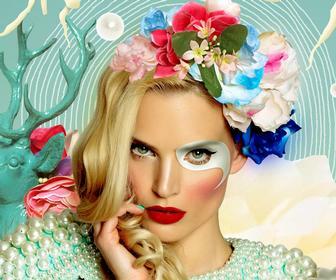 There's no support in any of Adobe's other software applications – nor Sketch, Cinema 4D or any other major creative tool for the Mac. I know it's only a couple of months since this MacBook Pro was released – and Adobe et al have been tardy at supporting other new input mechanisms such as Microsoft's touch-and-twist totems (as seen on the Dial for the Surface Pro 4 and Surface Studio, and Dell's Canvas) – but at this point I think we can accurately describe the Touch Bar as a failed experiment. Unless Adobe announces a big update as I publish this and proves me wrong. After Effects doesn't support the Touch Bar. Better application support isn't the only reason I'd rate a full touchscreen over the Touch Bar – especially if you regularly use your laptop without a mouse, and in cramped conditions like the Southern train seat I'm currently writing this in. It's easier to do semi-precise tasks - select a shade, layer or point - applications with a touchscreen than a trackpad. Broader tasks like zooming and panning are more precise with a touchscreen too. Touchscreens aren't without their flaws - they're generally glossy and you get more glare than with this MacBook Pro's more matte screen, and they drain your battery. And if you've not used one before, they can take a little getting used to. However, for anyone who regularly uses a tablet or, arguably, a phone (ie everyone), it's more about getting used to using your applications slightly differently without the muscle memory you've built up for a mouse and keyboard – and that's also true for the Touch Bar. Finally, a touchscreen doesn't leave you without those function keys that you've probably got favoured shortcuts to trigger tools and Actions/macros from. 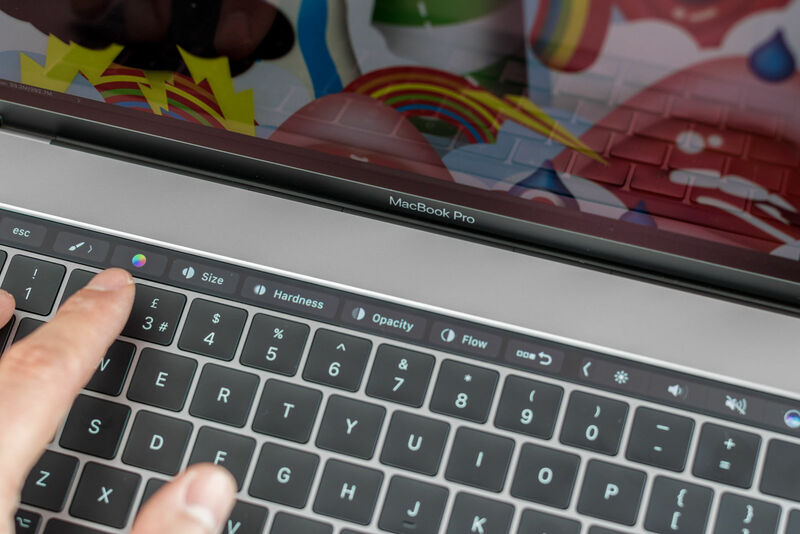 The Touch Bar might not be that appealing, but the trackpad is a winner. 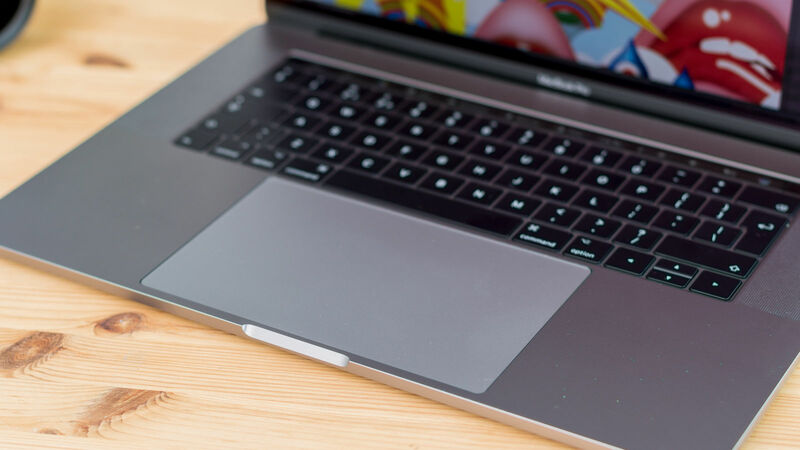 Compared to the pretty-large-already trackpad of the 2015 MacBook Pro, it's even easier to precisely position the cursor where you want it – and it makes the trackpad of the Dell Precision 5510 feel tiny in comparison. Some users have found it too big to use in cramped spaces like cafes and trains – the kind of places where using a mouse isn’t possible, though touchscreen are really useful here (hint, hint Apple). However I didn’t find it any more difficult to use in these circumstances than the 5510’s. What’s different from PC laptop keyboards is Force Touch – essentially pressure sensitivity that can trigger different things depending on how hard you press. This is nicely integrated into MacOS but we’ve yet to see it being supported by any major creative application. The keyboard is smaller to accommodate the new Trackpad, but after an initial period of adjustment that you get when changing from one laptop to another, it’s no better or worse than the keyboards of old MacBook Pros or rival Dell or HP models. Along with the Touch Bar, Apple's choice of ports for the new MacBook Pro caused much rolling of eyes and gnashing of teeth. And in the time since this new chassis was introduced in the winter, this is something that owners we've spoken to say is actually annoying rather than something you get used to. The USB, SD card and power connector of MacBook Pro's previous to 2016 – and of all of the MBP's rivals – are gone, replaced with four Thunderbolt 3/USB-C ports (the headphone jack remains, phew). The power cable plugs into any one of these, and you can buy adapters to connect USB devices, monitors (via HDMI or DisplayPort) and read SD cards. There are advantages to this approach. The design of the side of the newest MacBook Pro looks better, and you can plug anything into either side of the laptop. This is especially convenient with power if you plug it in in lots of different places. However, the annoyances outweigh the benefits – especially if you're turning up at a client's office with a bag full of adapters and have to muck around finding the right one in front of them. 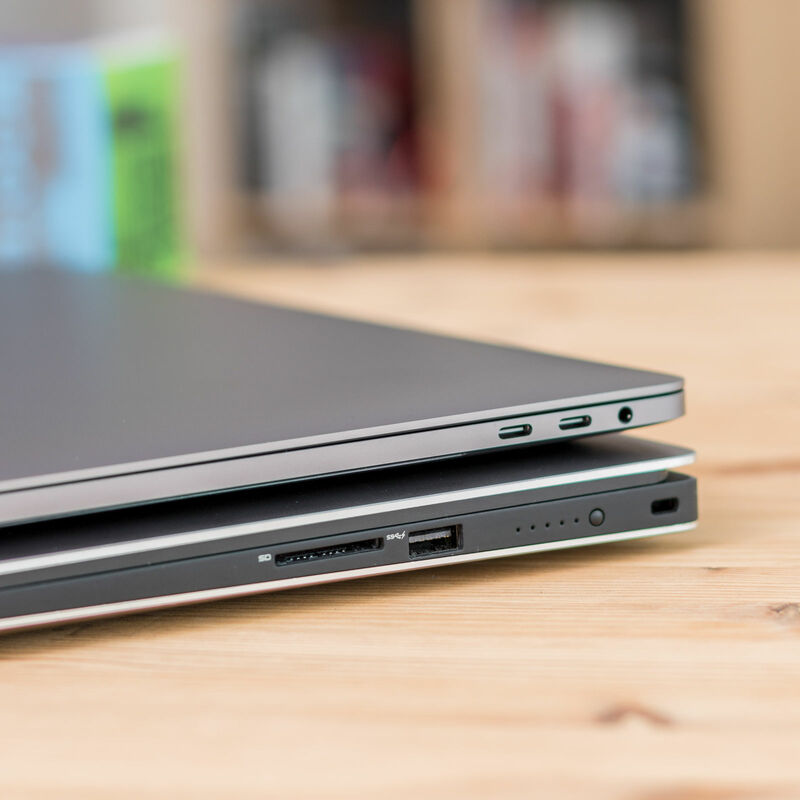 The latest MacBook Pro (top) lacks the useful ports of the Dell Precision 5510 (bottom). For many long-term Mac users, the idea of using Windows is like travelling on EasyJet – you're aware that lots of people do it but no-one seems very happy about the situation. And there's good reason: Mac OS is the superior operating system – especially for designers and artists who think visually. Working with files feels more intuitive, and everything looks better. However, ask yourself this – how much time do you spend in the operating system? If, like most creatives, you spend most of your time in your apps, then there's almost no difference. Digital designers who use the Mac-only Sketch are tied to Apple’s hardware and some Mac apps you use all the time are much better (Mail, specifically). But for most of us, the only difference between using a Mac and a PC is the two inches between where you put your finger for Ctrl or Cmd for keyboard shortcuts. The external design of the MacBook Pro hasn’t changed much apart from you can also get it in a darker Space Gray (not-really-a-)colour scheme to match your iPhone/iPad Pro. It's not a million miles better looking than something like the Dell Precision 5520 (its identical-looking predecessor the 5510 shown here) – but it's still the best. There are main reasons to wail on the MacBook Pro – the largely pointless Touch Bar, the annoying lack of even a single USB port (where's my adapter gone, damnit) – but I'm happy to say that the MacBook Pro is back. Especially if you don't like touchscreens. With industry-leading performance and great looks, we consider the MacBook Pro an excellent laptop for designers and artists.